The amazingly fun to drive Mazda MX-5 Miata is back for its 25th year, and like a fine wine, the Mazda MX-5 Miata has only gotten better with age. This model year, Mazda is offering the roadster in a 25th Anniversary special edition trim level, while the Sport trim replaces its vinyl top with cloth. Keep reading our 2015 Mazda MX-5 Miata review to learn about all the features and amenities on this year's model. The 2015 Mazda MX-5 Miata in Springfield comes in four trim levels: Sport, Club, Grand Touring and 25th Anniversary Edition. The base Sport trim features a cloth convertible top with a glass rear window, cloth seats, 16-inch alloy wheels, a leather-wrapped steering wheel, foglights and a six-speaker sound system. The Club trim adds sportier front and rear fascias, keyless entry, a leather-wrapped shift knob, a trip computer, black exterior trim, steering-wheel-mounted audio controls and unique interior materials. The next level Grand Touring trim adds even more luxury amenities, including leather upholstery, heated seats, automatic climate control, an auto-dimming rearview mirror, silver interior accents, a seven-speaker Bose audio system and a choice of either black or beige cloth top. We recommend adding the Suspension package if you want greater handling, as it adds a limited-slip differential and a sport-tuned suspension with Bilstein shocks. The Premium package for the Grand Touring gets keyless ignition and entry, Bluetooth connectivity, satellite radio and xenon headlights. The 25th Anniversary Edition gets both the Suspension and Premium packages as standard, along with upgraded leather upholstery and unique 17-inch alloy wheels. Under the hood, the 2015 Mazda MX-5 Miata is powered by a 2.0-liter inline four-cylinder engine that rates at 167 horsepower (manual transmission) and 140 lb.-ft. of torque. Drivers have their choice between either a manual gearbox or an automatic transmission, but our 2015 Mazda MX-5 Miata review recommends the manual gearbox for those who want to make the most out of the Miata's nimble driving feel. The 2015 Mazda MX-5 Miata is now in Springfield. Stop by our showroom today and take this fantastic roadster for a test drive! 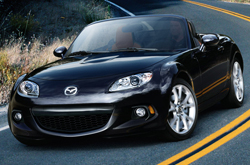 The 2015 Ford Mustang, Mini Cooper and the Fiat 500 are outranked by the 2015 Mazda MX-5 Miata in a multitude areas. You'll be smitten with the Mazda MX-5 Miata's long list of appealing characteristics, including its inexpensive price and progressive onboard technologies. 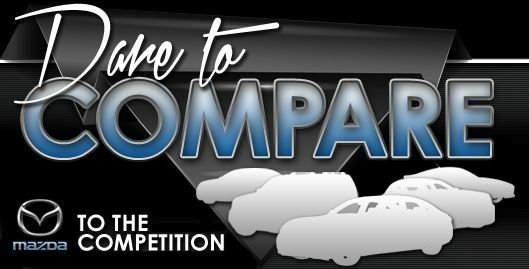 Compare its price against the opposition and you'll surely see that it's a fantastic value, which makes it a number-one choice for many Springfield Mazda customers. Check out our Quick List below for more information! Does the Mazda MX-5 Miata have what you want out of a vehicle? Check out Reliable Mazda's overview above, as well as other 2015 Mazda reviews to find the best model for your needs. Because it's time consuming to get reviews with up-to-date specs on dealer sites, we've made it our responsibility to provide reviews from experienced writers. You can count on the information in this article to be ultra-precise and provide you with the details you need to decide if you want to take home the Mazda MX-5 Miata. Now that you've read Reliable Mazda's review of the 2015 Mazda MX-5 Miata, please pick up the phone and call us to find out about OEM incentives and exclusive offers, so you can save substantially on your next purchase!